The study found food waste accounted for 20 percent of the materials going into the landfills and totaled 556,313 tons. While the amount of food being thrown out went up — researchers found less of a common packaging material in the landfills. “The good news I guess is that corrugated cardboard has significantly decreased since the 2011 study,” Anderson says. He says it’s obvious efforts to keep cardboard out of landfills has paid off. “Cardboard had been part of recycling programs pretty much since day one — but now we’re seeing increased participation from the residential side — but probably more importantly from the industrial, commercial and institutional side, seeing that decrease,” according to Anderson. “Cardboard has a pretty strong market value, so it’s good to see that material get pulled out of the waste stream.” The amount of cardboard dropped by 50 percent since the last study. Plastics were the second most landfilled item in the study. He says plastic bags and film pose a big problem for recyclers. “Typically they are not put in the curbside programs, the processors have issues with the bags and the film getting wrapped around their equipment so they are continually having to shut down their processing lines to get somebody to go in there and free up those machines,” Anderson explains. Anderson says retailers have programs to take back the plastic bags, but that requires consumers to follow through and take them back. The amount of plastic film, wrap and bags found in landfills increased by 15 percent compared to 2011. Some communities have gone to a system where all recyclables are place in one bin for pick up and then sorted once they are trucked to the waste plant. Anderson says this makes recycling easier, but says there is a downside if people don’t follow the instructions. “People you know think, well this is a plastic, it can be recycled. Not all recyclable materials can be put into curbside bins. You really need to follow the directions…what does your community program take,” Anderson says. The study found there are some bottles and cans with a deposit on them that are landfilled. But he says overall the number of deposit containers landfilled is small, so he says it appears that program is working. 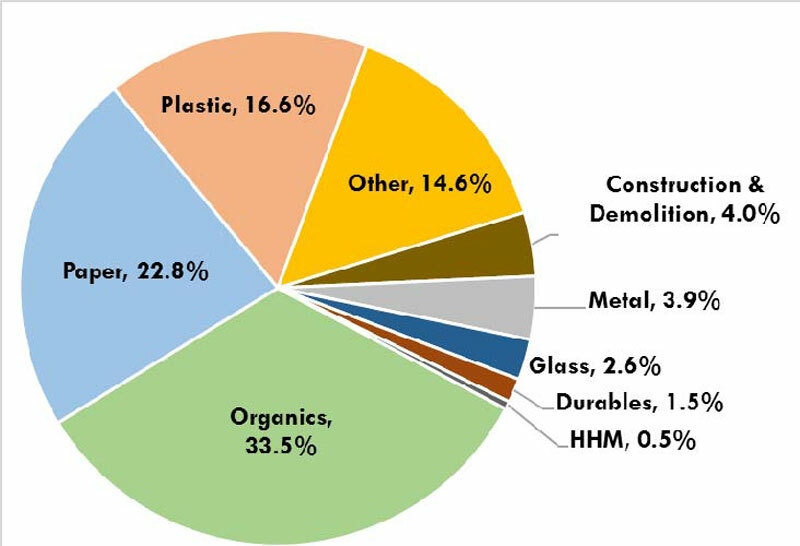 Paper was another large component of the material in landfills — total 25.5 percent. The study looked at the recycling market prices at the time of the study and found the value of the common recyclable paper and containers that are sent to the landfill instead of being recycled is more than $60 million. Cedar Rapids/Linn County Solid Waste Agency Site #2; City of Cedar Falls Transfer Station; Dubuque Metropolitan Area Solid Waste Agency Landfill; Iowa City Landfill and Recycling Center; Landfill of North Iowa; Metro Waste Authority (Des Moines Metro)- Metro Park East Landfill, Central Transfer Station, Northwest Transfer Station; Newton Sanitary Landfill; South Central Iowa Solid Waste Agency Landfill; Poweshiek County Transfer Station; Rathbun Area Solid Waste Management Commission Transfer Station; Waste Commission of Scott County Landfill; West Central Iowa Solid Waste Landfill; Crawford County Transfer Station.